he Pig War was a confrontation in 1859 between American and British authorities over the boundary between the United States and British North America. The specific area in dispute was the San Juan Islands, which lie between Vancouver Island and the North American mainland. The Pig War, so called because it was triggered by the shooting of a pig, is also called the Pig Episode, the Pig and Potato War, the San Juan Boundary Dispute or the Northwestern Boundary Dispute. The pig was the only "casualty" of the war, making the conflict bloodless. The Oregon Treaty of June 15, 1846, resolved the Oregon boundary dispute by dividing the Oregon Country/Columbia District between the United States and Britain "along the forty-ninth parallel of north latitude to the middle of the channel which separates the continent from Vancouver Island, and thence southerly through the middle of the said channel, and of Juan de Fuca Strait, to the Pacific Ocean." However, there are actually two straits which could be called the middle of the channel: Haro Strait, along the west side of the San Juan Islands; and Rosario Strait, along the east side. In 1846 there was still some uncertainty about the geography of the region. The most commonly available maps were those of George Vancouver, published in 1798, and of Charles Wilkes, published in 1845. In both cases the maps are unclear in the vicinity of the southeastern coast of Vancouver Island and the Gulf Islands. As a result, Haro Strait is not fully clear either. In 1856 the US and Britain set up a Boundary Commission to survey the international boundary. 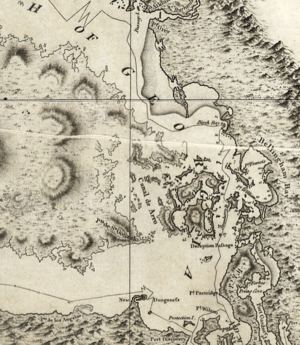 Since the boundary around the San Juans had not been resolved the commissioners made proposals and counter-proposals. There were three main proposals considered, Haro Strait, Rosario Strait, and a compromise line running through San Juan Channel. The extreme US proposal was "in accordance with the strict letter of the treaty", and ran between Vancouver Island and all islands off its coast, including the San Juans and Gulf Islands. This line was never seriously considered. The British commissioners made their case in part by referring to maps made by Americans that showed the boundary running through Rosario Strait. Among such maps was one by highly regarded American geographer John C. Frémont. Nevertheless, the commissioners could not reach an agreement. Because of this ambiguity, both the United States and Britain claimed sovereignty over the San Juan Islands. During this period of disputed sovereignty, Britain's Hudson's Bay Company established operations on San Juan and turned the island into a sheep ranch. Meanwhile by mid-1859, twenty-five to twenty-nine American settlers had arrived. San Juan Island held significance not for its size, but as a military strategic point. While the British held Fort Victoria (British Columbia) on Vancouver Island to the west, overlooking the entry point to Puget Sound at the Straits of Juan de Fuca, the nation holding the military presence on San Juan Island would also have a vantage point for Haro Strait and the Straits of Georgia. On June 15, 1859, exactly thirteen years after the adoption of the Oregon Treaty, the ambiguity led to direct conflict. Lyman Cutler, an American farmer who had moved onto the island claiming rights to live there under the United States' Donation Land Claim Act (1850), shot and killed a pig rooting in his garden. He had found the giant black boar eating his tubers while a man stood next to the fence laughing. Cutlar was so upset that he took aim and shot the pig. The mysterious man then ran away into the woods. It turns out that the pig was owned by an Irishman, Charles Griffin, who was employed by the Hudson's Bay Company to run the sheep ranch. He also owned several pigs which he allowed to roam freely. The two had lived in peace until this incident. Cutlar offered $10 to Griffin to compensate for the pig, but Griffin was unsatisfied with this offer and demanded $100. Following this reply, Cutlar believed he should not have to pay for the pig because the pig had been trespassing on his land. (A possibly apocryphal story claims Cutlar said to Griffin, "It was eating my potatoes." Griffin replied, "It is up to you to keep your potatoes out of my pig.") When British authorities threatened to arrest Cutlar, American settlers called for military protection. William S. Harney, commanding the Dept. of Oregon, initially dispatched 66 American soldiers of the 9th Infantry under the command of Captain George Pickett to San Juan Island with orders to prevent the British from landing. Concerned that a squatter population of Americans would begin to occupy San Juan Island if the Americans were not kept in check, the British sent three warships under the command of Captain Geoffrey Hornby to counter the Americans. The situation continued to escalate. By August 10, 1859, 461 Americans with 14 cannons under Colonel Silas Casey were opposed by five British warships mounting 70 guns and carrying 2,140 men. During this time, no shots were fired. The governor of the Colony of Vancouver Island, James Douglas, ordered British Rear Admiral Robert L. Baynes to land marines on San Juan Island and engage the American soldiers under the command of Brigadier-General William Selby Harney. (Harney's forces had occupied the island since July 27, 1859.) Baynes refused, deciding that "two great nations in a war over a squabble about a pig" was foolish. Local commanding officers on both sides had been given essentially the same orders: defend yourselves, but absolutely do not fire the first shot. For several days, the British and U.S. soldiers exchanged insults, each side attempting to goad the others into firing the first shot, but discipline held on both sides, and thus no shots were fired. When news about the crisis reached Washington and London, officials from both nations were shocked and took action to calm the potentially explosive international incident. In September, U.S. President James Buchanan sent General Winfield Scott to negotiate with Governor Douglas and resolve the growing crisis. This was in the best interest of the United States, as sectional tensions within the country were increasing, culminating in the Civil War. Scott had calmed two other border crises between the two nations in the late 1830s. He arrived in the San Juan's in October and began negotiations with Douglas. During the years of joint military occupation, the small British and American units on San Juan Island had a very amicable mutual social life, visiting one another's camps to celebrate their respective national holidays and holding various athletic competitions. Park rangers tell visitors the biggest threat to peace on the island during these years was "the large amounts of alcohol available." This state of affairs continued for the next 12 years. In 1871 Great Britain and the United States signed the Treaty of Washington, which dealt with various differences between the two nations, including border issues with the newly-formed Dominion of Canada. Among the results of the treaty was the decision to resolve the San Juan dispute by international arbitration, with Kaiser Wilhelm I of Germany chosen to act as arbitrator. Wilhelm referred the issue to a three-man arbitration commission which met in Geneva for nearly a year. On October 21, 1872, the commission decided in favor of the United States. On November 25, 1872, the British withdrew their Royal Marines from the British Camp. The Americans followed by July 1874.